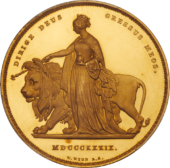 Victoria (1837-1901) Gold Sovereign, 1869, die number 14, second larger young head left, ww incuse on truncation without stops, date below, rev crowned quartered shield of arms within laurel wreath, die number 14 below, emblems below (Bentley 195 this coin; Marsh 53; MCE 529; S.3853). Spot on neck, light hairlines and surface marks, otherwise extremely fine. ex Douro Cargo, Spink Auction 118, 20-21st November 1996, lot 558pt. Bentley Collection part 1, Baldwin Auction 73, 8th May 2012, lot 195.